Join the discussion on our forums! 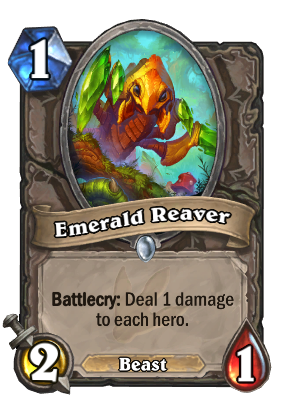 Come discuss Emerald Reaver over in our dedicated Emerald Reaver discussion topic. Battlecry: Deal 1 damage to each hero. Not to be confused with clubbing enthusiast Emerald Raver. It's not in any of my hunter decks, but if your opponent happens to be at one health and behind an Obsidian Statue, pulling this from Deathstalker Rexxar's Build-a-Beast is amazing. This is a good card. The number of times it helped me with that one health hit to the opponent is not even funny. Looks bad, but playing face hunter, I've had a priest or warrior down to 1 health for multiple turns before, just praying to topdeck anything with direct damage. This would work. But what one drops would I replace? Stats just aren't quite there. Actually I really like this in Hunter, just because the amount of 1 drop you would run with the quest, the ability to trade up as a 2/1, guaranteed face damage and beast synergy. I think if you are considering running 10+ 1 drops, not op and decently playable cards like this that synergize with your class is great. NOOO! I DON'T WANT ANOTHER PACK FILLER! Exactly, I'm really not looking forward to facing hunter when the meta shifts. I know there are lots of taunt but quest/face deck is going to eat through them. What's worse, if face fails too much from all the taunt, Jade Druid will be stupid to deal with. It is such a bad card that the only useful thing you might get out of it is enabling Battle Rage to draw a card from your face. worse than an early game shadowverse card. So you're telling me it's pretty bad. Well the less op 1 drops they print the better so it's fine. Old leper gnome was auto include in aggro decks, this is decent balancing. Is this supposed to be the ultimate no respect finisher? After elven archer ofc. How is a card thats pre-nerf leper gnome but with a beast tag instead of 1 face damage bad? It's a one cost minion it's not supposed to beat Deathwing. Maybe that's not tournament level card but for ladder it's okay. Useless card to get you p!ssed when you get it from packs. Even quest hunters won't use it. Not overly impressive. I am saying this as one who likes to try and make Control hunter viable, so I might be biased, but this is just not good enough even in an aggro deck I don't think. I could be wrong though, not like I know what I'm talking about. Oh why couldn't they print more cards for Aggro Priest?